There are many reasons why the stories of athletic accomplishment are so compelling. One may be that once given that opportunity, a few select individuals emerge to amaze us with their accomplishments. 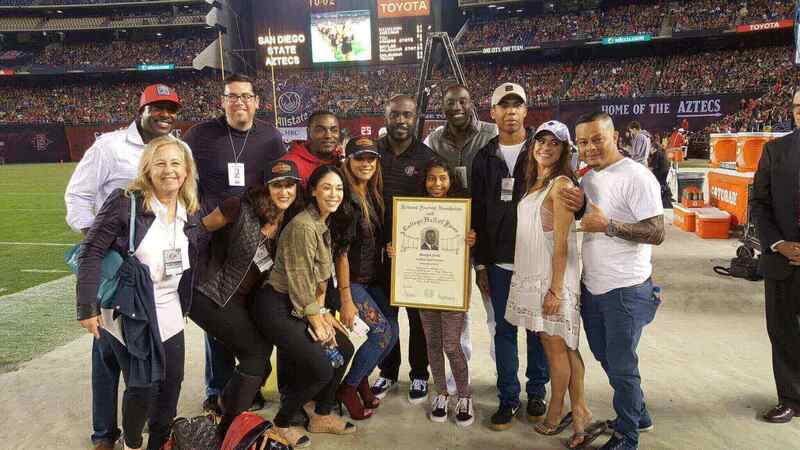 Such is the case with San Diego State running back Marshall Faulk. Faulk grew up in New Orleans’ Ninth Ward. Sports were always a great escape from the bad influences in the neighborhood and at a young age began shaping Marshall into the man he is today. With the combination of his high school football coach Wayne Reese’s guidance, the football practice regime and Marshall’s maturity, Faulk stayed focused on college football recruitment opportunities. He was recruited by numerous major college teams including Louisiana State, Miami and Nebraska. But, they all wanted him to play defense. San Diego State assistant Curtis Johnson was a Louisiana native and gave Marshall the opportunity to play offense sending Faulk to the West Coast. There, he would eventually be teamed with future New Orleans Saints Head Coach Sean Payton as his position coach. Faulk was given the starting assignment in his first game, but netted only 39 yards on 11 carries as he shared playing time T.C. Wilson. The following week against Pacific, Wilson came out of the game in the second quarter after a hard tackle, sending Faulk into the game. At the half, Marshall had scored twice and amassed 129 yards. He opened the second half with a 61-yard score and then added four more touchdowns including a 47-yarder. His final carry was a 25-yard TD as he finished the day with 377-yards and seven touchdowns. Playing in just his second game, his yardage set a new all-time college football single-game rushing mark. Yet, he still had not cracked the starting lineup until three weeks later against Hawaii. Against the Rainbows he would score five touchdowns. The following week against New Mexico he fractured his ribs, which collapsed a lung sending him to the hospital for a week. He would only sit out three games before returning to the lineup. He closed his freshman year with 1,429 yards and 21 touchdowns as he became only the third first-year player to be named a first-team All-America in the modern era. combination of his high school football coach Wayne Reese’s guidance, the football practice regime and Marshall’s maturity, Faulk stayed focused on college football recruitment opportunities.